Like most kids, I took my surroundings for granted. The weekly trips to my godmother’s home – a sprawling, sun-drenched apartment across the street from the American embassy in Moscow – were just part of the routine. I watched my godmother’s small daughter, Vera, as she ran among the gigantic canvases that lined the walls throughout the apartment. We tried to guess the places and faces that were depicted in the art, never considering that we were privy to something unusual and incredible: Vera’s grandfather is one of Russia’s most celebrated painters, Pyotr Ossovsky, and this was (and still is) his studio. 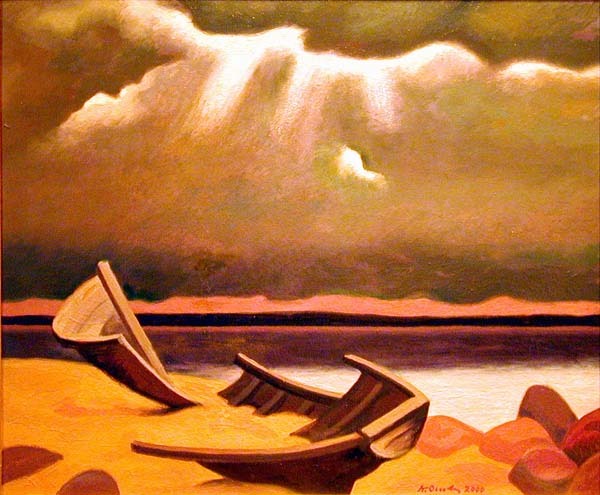 According to the Russian museum, Ossovsky is regarded as the founder of the “harsh style” in the Soviet art. I was very surprised to read this (and reminded yet again of why art criticism and art history should really be absorbed with a healthy dose of skepticism). I’d call Ossovsky’s art nostalgic, with that typically Russian longing for the past. Melancholy. Painfully beautiful. Spiritual. Geometric and crisp, with light that draws you into the scene and keeps you there. But harsh? Hardly, in my opinion. Perhaps this was the Soviet way of showing Ossovsky that big brother was watching and evaluating, making sure he didn’t step outside the boundaries established by the party. Ossovsky is, after all, known for having constantly sought out new ways to paint “against the rules” of official Soviet art. The Russian Museum also writes that Ossovsky belongs to the generation of the “men of the sixties.” Again, I see few reasons to pin a man who’s painted throughout his life to a fleeting decade. He didn’t stop experiencing the world in 1969. He’s witnessed the fall of the Soviet Union, the emergence of Russian-style capitalism, the advent of the Web. He certainly doesn’t step into a time machine to get back to painting his canvases. If anything, his works have a timeless quality. 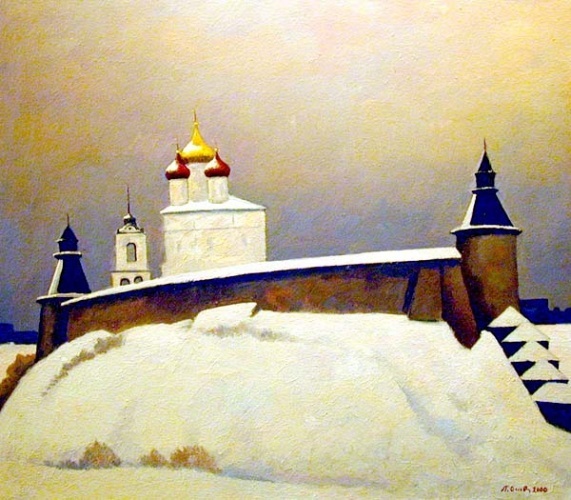 And his church pieces take on a new significance when you consider the fact that during his lifetime, Stalin tore down or hid the Russian Orthodox churches, systematically erasing golden steeples from the Russian skyline. Ossovsky has also witnessed the unveiling and rebuilding of these same churches in the last two decades. Though I don’t know how he continued to produce religiously-themed works during the era of spiritual destruction (or were they in that home studio that politicians never saw?). But while Stalin destroyed, Ossovsky preserved, giving the Orthodox tradition a continuity on canvas that it could not have on the streets. Last time I saw Ossovsky, I was in Moscow writing my master’s thesis on the city’s outdoor advertising and interviewed him on the topic. He, like most Russians, hates the sky-blocking billboards and had a lot to say on the topic of Moscow’s transformation. His keen awareness of his modern-day surroundings makes it even more unnatural to tie him to a period half a century ago. Isn’t it much more interesting to juxtapose his new work with the current reality and glean some meaning from that? You can see more of his pieces here and judge for yourself. Ossovsky is a state-recognized Russian Artist, which means that his works cannot be brought out of the country without the government’s permission. He wants to show more in the US, but these rules make planning difficult. So, for now, his paintings stay with him in Russia, enjoying their local celebrity status. At least until I find a way to organize an American trip for them – because I’m certain that unlike Russian screen superstars, whose lack of English prevents them from making it in Hollywood, Ossovsky’s work would have no trouble finding a way to communicate with its new audience.